The famous artist Roerich painted his picture “Madonna Oriflamma” specially for the Pact of the World. Thoughts about this Pact too often did not leave the artist, therefore their echoes can be seen in many of his works. He used the “Signs” emblem in more than half of the paintings of the 30s. In his picture, the artist depicted Madonna, holding in her hands the painting with the “Sign”. To some extent, the artist has depicted the women’s struggle for equality in his work. This struggle in some countries lasts until today, and in the first decades of the 20th century, it stood very sharply. Therefore, Nikolai Konstantinovich could not help but pay attention to her. Quite often, women’s associations actively defended all the ideas of the artist, including the “Sign of the World.” Well, the artist himself believed that the thin female nature would help people in the whole world to look at culture and creativity in a new way. Madonna is considered the feminine beginning. In the artist’s picture, the majestic appearance of Oriflame symbolizes the Divine manifestation in the visible and invisible worlds. Bright golden halo, as a symbol of spirituality is proof of this. Roerich managed to penetrate into the subtle realms of Being, and transmit through his work all the existing feelings and impressions. Roerich depicts Madonna in purple, the color reflecting Genesis. 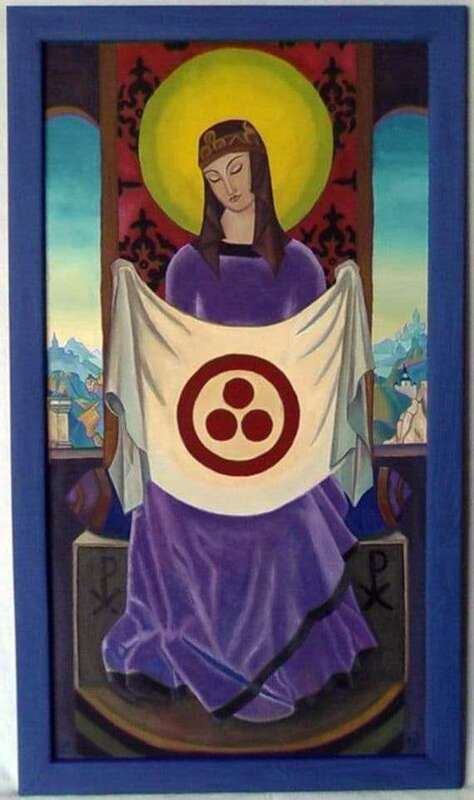 In the hands of Oriflamma, the Banner of Peace is stretched, expressed through the symbol of the trinity. The artist emphasizes the importance of the “Banner”, and shows that the Banner has been given to us by the Almighty. It is a way, an idea of ​​evolution and people need to comprehend this idea, its movement, without mixing all this with a low, worldly understanding.